Lthe wreck of a sunken 15th historically signi? cant was a really inter- personal emblem of Don Manuel I, the which was sunk by a storm in the Indian century ship in the Indian Ocean is the esting opportunity.” King of Portugal from 1495-1521. It is Ocean in 1503. earliest known marine navigation tool. Environmentally Considerate Lubricants voyages, but they were not certain as there were no visible navigational mark- ings. 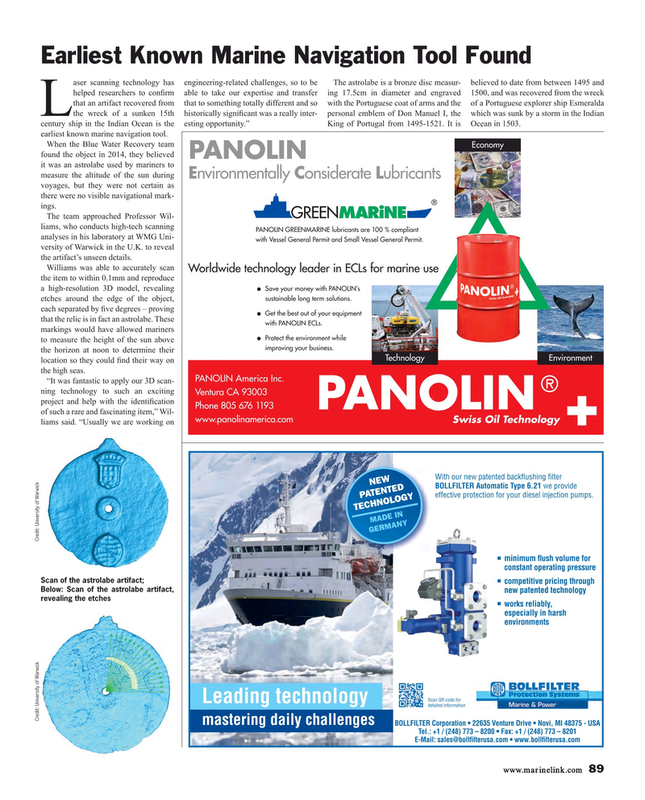 PANOLIN GREENMARINE lubricants are 100 % compliant analyses in his laboratory at WMG Uni- with Vessel General Permit and Small Vessel General Permit. versity of Warwick in the U.K. to reveal the artifact’s unseen details. O Save your money with PANOLIN’s sustainable long term solutions. O Get the best out of your equipment that the relic is in fact an astrolabe. These with PANOLIN ECLs. O Protect the environment while to measure the height of the sun above improving your business. Technology Environment location so they could ? nd their way on the high seas. BOLLFILTER Automatic Type 6.21 we provide effective protection for your diesel injection pumps.